Back in mid November the threats of imminent cold weather arriving from the polar regions failed to materialise, instead we were treated to some very mild days with the first half of December being almost free of rainfall. However, from the 13th of the month a series of low depressions swept in from the south and south west bringing with them high winds and rain and then day after day more wind and yet more rain. 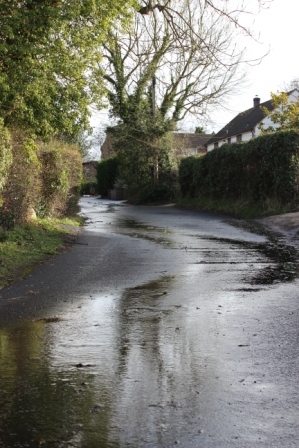 In the days before Christmas, along with many areas across the country, Outwood was battered with gale force winds and very heavy rain which brought down fence panels and trees both in gardens and out in the woodland; roadside ditches and drains became blocked with leaves and debris and overflowed and, whilst the water drained quickly from the village, low lying surrounding areas were badly flooded. In some places, drives on sloping ground lost significant amounts of loose gravel which was washed onto the roads on Millers Lane and Bletchingley Lane. I recall empting my rain gauge on two or three occasions but it wasn't until I read a met office report stating December had been the wettest since 1978 that I began to realise just how much rain had fallen on the village. This is where the daily rainfall recordings, made by my neighbour Brian Monk, really begin to put matters into perspective. His recordings show that from 13 December the rain began to fall in increasing volumes and by the end of the month the total was 19.45 centimetres (7.65 inches) and then the first eleven days of January produced another 11 centimetres (4.3 inches). The highest rainfall in twenty four hours occurred between 9am on 23 and 24 December with 66 millimetres or just over 2½ inches. Temperatures were also much higher than average and the month turned out to be the warmest on record. The mild weather has given rise to some unusual events. At a lunchtime party on 22 December a beautiful peacock butterfly seen fluttering outside the window suddenly flew in through the fanlight and settled on the windowsill obviously looking for a hibernation site and perhaps anticipating the storm that arrived the following day. Also, the British Trust for Ornithology reported a number of examples of birds, that normally migrate south for the winter, deciding to stay. Around the gardens the warmer temperatures have encouraged early flowering of hellebores and cyclamen along with the winter favourites such as vanilla scented sarcocca, the yellow spires of mahonia, the winter cherry which flowers in mild spells between autumn and spring and the pink, luscious, perfumed blooms of viburnum bodnantense. Interestingly, the bird feeders have had many fewer visitors than usual during November and December, although numbers have returned to normal since Christmas. The reason for this lack of visitors may be due to them continuing to feed on the remnants of last season's huge crop of fruit, berries and nuts. Squirrels, which are normally safely tucked up in their dreys at this time of year, have ventured out to top up their fat stores at the peanut feeders. Talking of squirrels a piece of really good news comes courtesy of the Tresco Times the newsletter for the beautiful isle in the Scillies. As a result of a collaborative effort between Robin Page the countryman and Daily Telegraph contributor, The Countryside Restoration Trust and the British Wildlife Centre, nearby in Newchapel, red squirrels have been introduced to the island around the sub tropical Abbey Gardens where there are no grey squirrels and therefore no threat from the deadly pox they carry.